If there is a single car that typifies the end of the American muscle-car era, this has to be it. 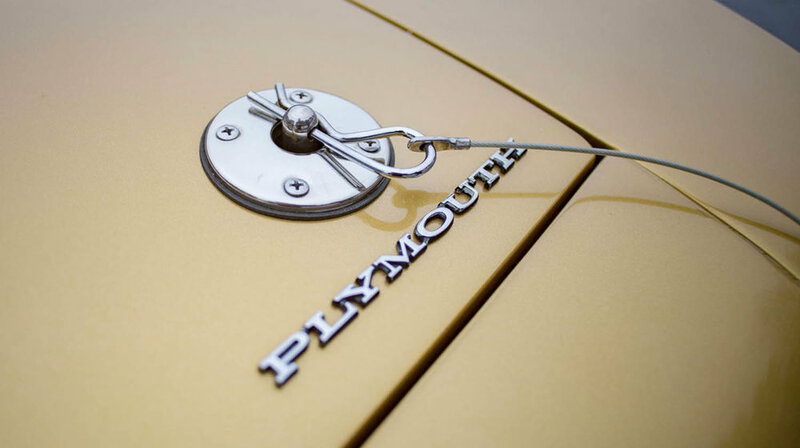 Although Mustangs and Firebirds were still on the menu, the 1971 Plymouth Hemi Cuda reigned supreme. This combination would end the year with its reputation and compression intact, finally bowing to the market pressures of government regulation and insurance premiums. 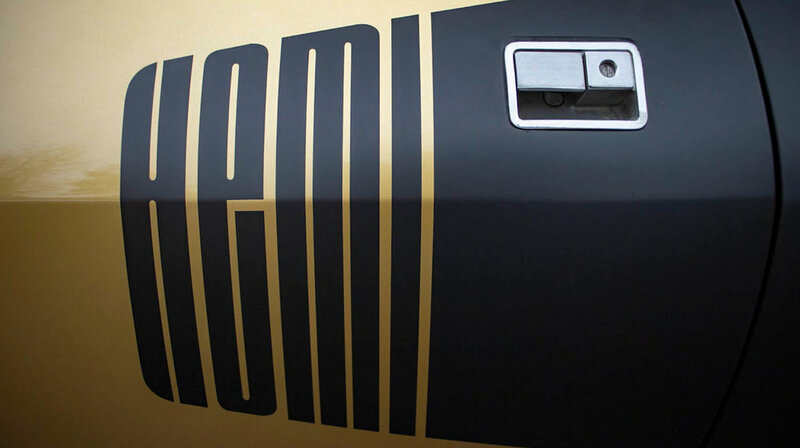 That model year, only 108 Hemi Cuda hardtops were produced. Under the Shaker scoop is the legendary Chrysler Hemi engine, originally created for NASCAR dominance and in its final production year in 1971. Dual 4-barrel carburetors scream for mercy as they push fuel through the hemispherical cylinder heads, with dual exhaust emitting a fearsome roar. That normally quivering Shaker hood, complete with hold-down pins, arches to one side if you dare to look away from the road. This car is equipped with the heavy-duty TorqueFlite automatic transmission and Super Track Pack with power brakes to help while you are enjoying the ride. 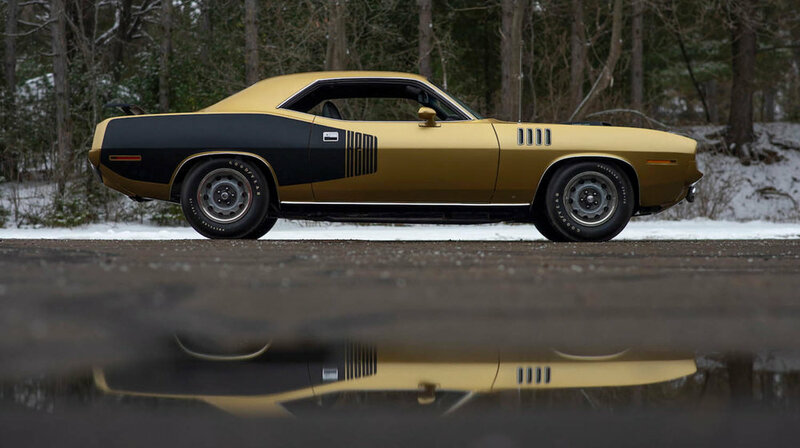 This Hemi Cuda features the unique combination of Goldleaf Metallic paint coupled to black Hemi billboard striping. Inside are bucket seats, Slap Stik shifter, Rallye instrument cluster and a desirable 8-track player with Dictaphone equipment. Outside are the Go Wing rear spoiler, body-coloured front and rear bumpers, deluxe roof drip rail, decklid and wide sill moldings and tinted glass. The well-defined grille, front wing gills and lights accent it, finished off with Rallye wheels. This 1971 Plymouth Hemi Cuda was featured recently at the Mecum’s Kissimmee auction. For more information on this car and others in the sale, click on the link below. Photos courtesy of Mecum Auctions.